With a loyal commitment to their exciting new collection of holiday-centric toys, Step2 is thrilled to keep spreading festive cheer to every good little girl and boy! It all started back in 2017. Step2 felt its expertise in fanciful designs and sturdy construction naturally lent itself to creating a brand new line of seasonal products. So, they premiered with one single introductory toy for that year’s holiday season…called My First Christmas Tree. Almost overnight, it became a huge hit! Kids loved its pint-sized height, the bright plastic ornaments, the reachable star on top, and the adorable toy train set underneath. Parents loved the fact that their little ones weren’t getting hurt on prickly branches or fragile ornaments. They loved how it was both sturdy and cute. And they loved how happy it made their kids. 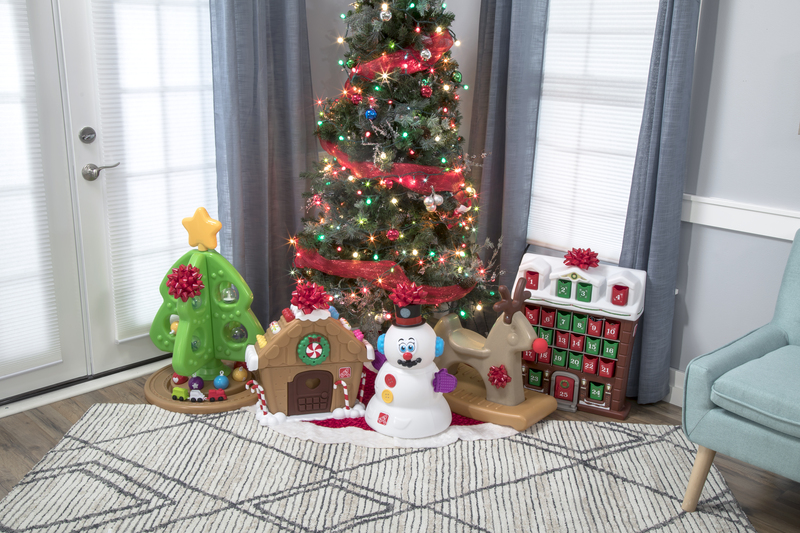 Whimsical-looking frosting swirls, candy canes, and gum drops that light up offer a sweet way for your tot to decorate this beautifully detailed house. Extra accessories include a gingerbread man, snow caps, and a wreath that also lights up. When the fun’s all done, just store the pieces inside the house—until it’s time to decorate all over again! This adorable advent calendar resembles a snowy cottage and offers kiddos a daily surprise for all the days of December leading up to Christmas. There are 25 whimsically decorated bins to hold 25 individual treats (not included). Use your imagination to reward your child’s giddy anticipation! Cute as a button, this little guy comes with 15 colorful parts that your tot can mix and match for the silliest expressions. His electronic hat, which lights up, plays the catchiest holiday music. And his hollow belly secretly hides all the extra pieces for super easy cleanup and neat storage. This sweet rocking reindeer—complete with antlers and a squeaky red nose—will provide hours of giggly fun for your toddler. Built to help prevent tipping or over-rocking, it also boasts a comfy contoured seat and easy-to-grip handlebars—all while still being lightweight enough to pick up and carry. Lucky parents today have so many more choices than last year to surprise and delight their little ones during the upcoming joyful holiday season. Which one will you pick? Step2 Introduces My First Advent Calendar!